3… 2…. 1…. We’re live! While we’ve previously discussed how to incorporate Periscope into your event, live video will continue to be an integral element of events in 2017. With social platforms such as Facebook, YouTube, Twitter, Instagram and Snapchat focusing heavily on live stream video content in 2017, it’s now time to embrace this trend. While certain event professionals worry it will destroy attendance and engagement, it doesn’t have to be the case. The truth is that the ability to participate remotely will not be an incentive to avoid physical attendance. 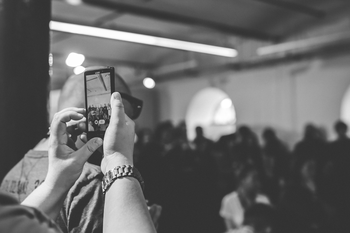 In fact for event planners and marketers, live video is one of the most powerful tools to expand their events reach and draw attention to their events value proposition. For those who are attending events, how much emphasis is placed on the event’s location, its surroundings, and other core elements? How much of this is carefully aligned with the particular needs of the average participant? Getting this alignment right is more important as millennials come of age, a generation that rewards brands that provide a high degree of personalization. The bottom line is that attendees want more personalized experiences, and what the attendee wants, the event organizer must provide. 2017 will be sure to see a high rise in the amount of time spent preparing venues and events that mirror the expected attendees tastes and preferences. Live data is now available at the touch of our fingertips, and what event professionals will begin to do with this data in the coming years will arguably change the industry forever. Real-time data will include each participant’s attendance duration, previous events they’ve attended and even allow attendees to submit real-time feedback, reducing the need for guess-work. It will also allow for that aforementioned level of personalization and niche-customization that attendees crave. Event data analytics and big data will help planners to enhance the attendee experience and improve events. 2017 is the year for the event industry to get on-board with the big data revolution. In the past, leisure activities have only occurred during an individual’s “free-time”. When else would one have the opportunity? At events – that’s right – event planners are now incorporating leisure activities, especially as an integral part of corporate events. The reasoning? You can only concentrate for so long before you begin to lose concentration altogether .“Brain-breaks” will be sure to keep you on your toes through 2017 and beyond. 2017 will be sure to see more cloud based solutions that help event organisation plan and manage their events. Solutions such as BriteVenue are making noise in this space, not only helping event planners to be more efficient with their time, but also to be more effective with their ability to handle multiple resources and events at any one time. So there you go, the trends for the event planning industry over the coming year. What a truly exciting time to be involved in the event industry!